Used with permission from the Howard Hughes Medical Institute (www.hhmi.org). All rights reserved. 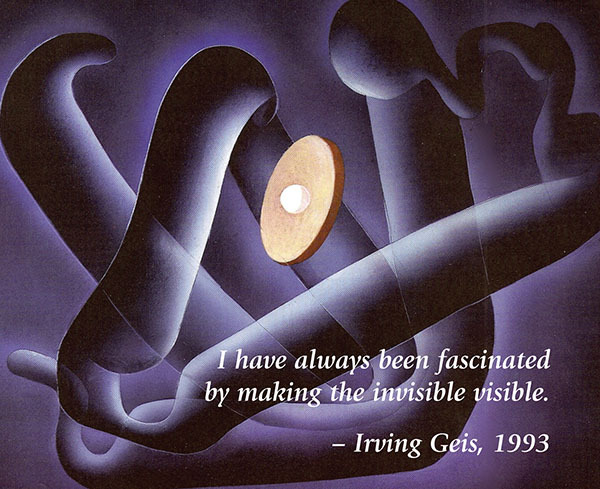 Irving Geis (1908-1997) was a gifted artist who helped illuminate the field of structural biology with his iconic images of DNA, hemoglobin, and other important macromolecules. Through a collaboration with the Howard Hughes Medical Institute (HHMI), which owns the Geis Archives, the RCSB PDB has established a digital archive of Geis' molecular art. This resource displays many of Geis' illustrations in the context of the corresponding PDB structures and related molecular information. Through this archive, these images will be available for download for noncommercial usage. Sandy Geis, Irving Geis' daughter, has been a driving force in the creation of this archive. Her dedication to her father's legacy has been an inspiration to the many students who created this resource. Under the direction of RCSB PDB team members, the Geis Digital Archive is being developed by undergraduates. Students created modern visualizations of the molecules featured in Geis' work, including interactive views, and researched the structures to provide background and supporting information about the illustrations. Alex Alvarado (University of Southern California) and Nicole Werpachowski (Fordham College at Lincoln Center) created the initial design of the resource as part of their Rutgers RiSE (Research in Science and Engineering) experience. Their work was funded during the summer of 2015 by an NSF REU. Rutgers students Belle Lin (2015-2016) and Christopher Markosian (2015-2016) continued work on the project. In 2016, Raheel Ahmad (Rutgers), Pamela Amechi (University of Maryland Baltimore Country), and Keyerra Daniels (Winthrop University) expanded the archive as part of the Rutgers RiSE program. Thanks to Leda Cummings, Kimberly Ripley, Tina Moo Young, and Robert Tjian at the Howard Hughes Medical Institute for their work on this project. Questions about the HHMI Geis Archives should be sent to archives@hhmi.org.